The likelihood that Prime Minister Netanyahu will be given the mandate to form the next government in Israel is a remarkable achievement. It ratifies not only his own leadership but also the historic shift to the right in Israel over the past generation. It augurs well for Israel’s relations with America, which has been one of the bright spots in the eras of both Mr. Netanyahu and President Trump. The likelihood that Prime Minister Netanyahu will be given the mandate to form the next government in Israel is a remarkable achievement. 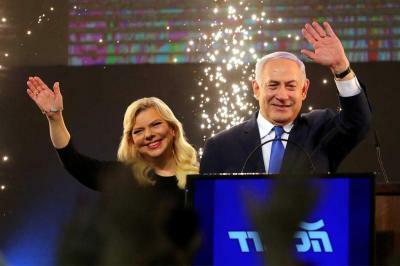 Mr. Netanyahu’s victory — if it holds — is all the more remarkable for the fact that it was achieved while he is facing a likely trial for corruption. Imagine, we’re tempted to suggest, the romp he could have made of this election if he did not have the cops on his tail. Then again, too, maybe the “American disease” of using criminal law to fight political battles invited such cynicism that it actually helped him. No doubt we’ll get a better sense of that in the weeks ahead. Just as we will of the one feature of this vote that disappointed us — namely the apparent failure of Naftali Bennett, the education minister, and Ayelet Shaked, the minister of justice, to win places in the 21st Knesset. From the remove of our editorial rooms they are two of the most attractive figures in the Israeli lineup. One of the things we liked about the Bennett-Shaked démarche was their attempt to marry — we’re talking only in the political sense — in a new party a religious-Zionist faction (Mr. Bennett) and a more secular, juridical faction (Ms. Shaked). In the cold light of dawn it looks like they lost both sets of followers and would have done better had they nursed their causes in league with Mr. Netanyahu. It’s not immediately clear, at least on this side of the ocean, what, if anything, will become of the remnant of Rabbi Meir Kahane’s rightist movement. Mr. Netanyahu triggered the leftists here in America by indicating he’d be prepared to work with them in a coalition. In the event, it may not be necessary for him to include the United Right party, of which Mr. Kahane’s followers were themselves but a part. As for the Left, it was the big loser in this election. The once towering Labor Party — which over the years handed up such leaders as David Ben- Gurion*, Golda Meir, and Yitzhak Rabin — is now reduced to something like six seats in the 120-person Knesset. Only a few years ago, that would have been unthinkable. No doubt it reflects, in part, the modern, capitalistic, free-market state Israel has become. That Israel can digest politically such changes is a testament to the vibrancy of its democracy. Democracy itself may not be Israel’s primary virtue (it is, after all, the Jewishness of Israel that is its unique and defining feature). Yet the decision of the founders of the modern state of Israel to strive for a democratic system has at least helped to secure Israel’s standing among the nations. The next test in that long quest may yet prove to be President Trump’s peace plan, which recent reports from the White House suggest could be unveiled as early as June. No reason to rule out entirely the possibility that it could work. Yet it could also be the undoing of what has just been ratified. If the Palestinian Arabs reject the peace plan, as they have all plans heretofore, then what? * Ben-Gurion’s party, Mapai, was part of what, in the late 1960s, emerged as the Labor Party.